Shrooms, Shrooms – Too Many Shrooms? Some of us foragers get really serious about stocking up on mushrooms during the season. Often, we are out in the middle of nowhere camping and we find ourselves with a dilemma – how to quickly clean and dry a large number of foraged mushrooms. Trent and I always smile during these situations – it’s a problem every forager hopes to encounter. So what do you do when you haul in several gallons of burn morels or pounds of king boletes? You improvise, naturally. 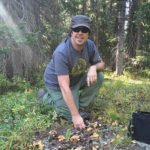 I won’t sugar coat it – getting all your mushrooms dry out in the woods is a painstaking process. In fact at some point, you need to break down and find some electricity. In the meantime however, there are numerous things you can do to ensure your shrooms begin the process of drying. The very best thing you can do for yourself is clean your mushrooms really well at the time you pick them. Don’t put dirty mushrooms in your bag! Spend the those extra few moments and you will be so thankful later. Brush off bolete caps and slice away all the dirt on the stems. 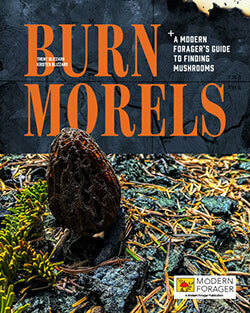 Tap the char off your burn morels and be sure to cut the dirt off the bottom of the stems. Use a bag that has some sort of mesh bottom so dirt and debris from the woods has a good chance to fall through as the day goes on. A clean bag of burn morels should be able to go right into the dehydrator. Much of the fine char and dirt will fall to the bottom of your dried container of shrooms and can be discarded later. Porcinis take time – it’s a good thing you love mushrooms. Some are wormy, some aren’t. You have to lovingly go through every mushroom once cleaned, and cut to check for worms and prepare for drying. If you have a generator (at least 2000W), you can get mushrooms dry using your dehydrator. This small generator really only handles one dehydrator machine well – otherwise you’ll need some earplugs. We’ve had success running the dehydrator on the genny all night long – you get used to the low hum and as long as you’ve got gas, you’re good to go. One dehydrator with 8-10 trays at 12 hours drying time doesn’t get you very far however when you’ve scored big. It’s small movement in the right direction though. We have a nifty mesh hanging rack that handles a pretty serious load of shrooms. Pending the weather, this is a great way to start the moisture loss. Even during a light rainy day under a well placed tarp, it will allow your mushrooms to lose some moisture. It also speeds up drying time in the dehydrator when you get room. Both morels and spring porcinis seem to do well for several days in hanging mode – long enough to get them on to the next step. We recently tried using dehydrator trays on top of a heat reflecting tarp. It was a warm, sunny day and this really added a nice bump to the drying process. And why not let those shrooms soak up some Vitamin D ? I’m not sure exactly how much it sped up the process, but this extra step did seem to help out a fair bit. This is no joke – often you are out ‘in the woods’ or at a campground near a very small town. We travel with 3 dehydrators, so all we really need is some electricity and we’re in business. Last week we ‘rented’ an outlet from a local business in Prospect, Oregon to dry 20 trays of mushrooms. It was awesome. The folks could not have been nicer, and they were happy to have a few extra bucks for a day of electricity. People are always curious about your find – it’s a good way to make friends. This is typically what we rely on – three days out hunting and then 1-2 overnights in a park. We run the dehydrators all day and all night until the mushrooms are dry. If we’ve employed some of the tactics above, the process is a bit quicker and things move faster. Since we are out-of-towners hunting for a few weeks, it’s almost impossible for us to avoid this step. A hot shower and some laundry is always a nice bonus. As with all good problems, we always find a way to make it work. Plan ahead – your morels will last 2-3 days if you treat them well – cool and dry environs. Porcinis are harder – if they get warm, the worms may develop even if they did not appear to be there when picked. Best to take care of them sooner than later. If you can’t – keep them cool/cold and dry. Worms like it hot and moist. We travel with lots of paper bags and gallon ziplocks. Fresh mushrooms should stay cool and dry. Paper bags are a great way to achieve this. Pending moisture levels and how long you plan to keep the mushrooms bagged, you may have to check bags and swap if they get too moist. We also use mesh bags to keep morels that we intend to dry. It’s a good way to start them drying a bit. Once dried, we keep our mushrooms in gallon ziplock bags. Be very careful to make sure all your mushrooms are dry! One or two slightly moist mushrooms in the ziplock can ruin an entire gallon of dried if not taken care of right away (put them all back in the dryer and get them finished!). I do most of my picking here in Colorado. 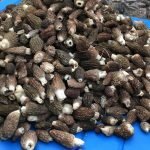 The morels are fairly dry at the time you pick them, so it does not take too much to finish drying them. However, once you start drying them you have to go all the way or they will rot. My only suggestion is the use of a RV park and plug-in your dehydrator. The fastest and sure way not to loose your harvest. If your lucky you can use the sun, but it attract the flies. After all, you spend the money, time and energy to harvest them, do yourself a favor to make easy on you during the drying process which you deserve. i use 8 trays which yield about 1 pound when dry. I like the idea of the generator in case you are out in the middle of nowhere. For the boletus I dry them immediately as I get home. Harvest in Colorado are so bountiful that my trips are a one to 2 days only. I love your blog, thanks for posting! Pierre, sounds like we are on the same page! We are also pretty uptight about drying Boletes quickly. We also always try to get them cool and keep them refrigerated until they dry… we believe that the bug eggs and larvae are already in the boletes and if you keep them at room temperature, or above, the bugs are busy chewing them up — get them cold and the bugs slow down. When we are camping we go to extremes to find ways to keep them as cool as possible for the day or two before they make it into a dehydrator. Hi Trent and Kristen, On our way to see you at the Grand Junction festival. Hoping to learn more that already known. I for years in Montrose used a ’48 Dodge Stakebed pickup given me by my dad. I just spread chicken wire across the wood frame pieces above the bed tied it on, and sliced the boletus but usually kept the hawkswings close to full size or divided minimally to spread all over the wire. Sunny days dried them quickly, sometimes two full coats per day. Flipping them after a couple of hours hastens the drying. Have to imagine that a sunny somewhat barren spot in the mountains will do the same. Did that once at around 11-11,500′. Brilliant idea! Unfortunately I think Trent is going to add chicken wire to our traveling kit now. Just what we need, one more thing to jam in the rig 🙂 Hope you enjoyed the talk today! See you tomorrow?